Fly Tying For Beginners by Peter Gathercole - A master class of fly tying techniques from a master fly tier. I bought the book for my fly tying class as an accompaniment to Peter Gathercole other book Fly tying Bible. It is easy to follow, easy to use and has further fly patterns which are not in the other book. 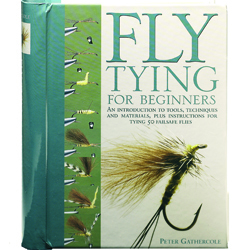 The picture and accompanying write are brilliant and any beginner who has not tied fly's before will find it easy, it is ideal as a reference book and the plastic pages make it easy cleanable. I highly rate this book and would advice anybody to buy it as a partner for his other book.